Police already know the identity of a man caught on security camera scratching cars parked in South Central Square, Lawaan, Talisay City. An officer said the man has psychological problems. Meanwhile, a cab driver returned P254,208 to a passenger who left the money in his taxi. After the Department of Environment and Natural Resources (DENR) 7 lifted the cease-and-desist order (CDO) it issued against DPWH for the removal of 79 trees from the street last year, Department of Public Works and Highways (DPWH) 7 can now proceed with its road works on Sergio Osmeña St.
Are you planning to buy a house unit or thinking of investing in one? 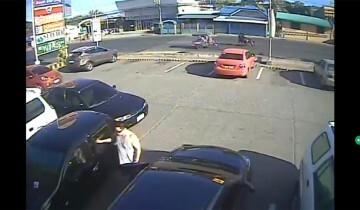 Police have identified the man caught on video scratching cars last April 18 at the parking lot of Robinsons Supermarket in South Central Square, Barangay Lawaan, Talisay City. They, however, refused to name him until a complaint is filed. Talisay City Police Chief Supt. Germano Mallari said that two years ago, the man also scratched and dented a car that was parked in the same parking lot. A complaint was filed against him but this was settled when his parents paid for the damage. Mallari told Sun.Star Cebu the man has a psychological problem. Robinsons Supermarket Lawaan 3 manager Danilo Lim said they have now intensified security inside and outside their establishment. Land Transportation Office Director Arnel Tancinco, meanwhile, advised car owners to avoid parking their cars anywhere and to avoid bringing their cars if the occasion doesn’t call for it. Valerio Boybanting, a father of five and a grandfather of 11, found a jacket containing dollars and a passport of a Korean national in his taxi last Tuesday. He asked Ken Taxi, the company he works for, for help in returning the money to the owner. He turned to Marico Castañares, Ken Taxi’s manager, for help. The Consulate of the Republic of Korea in Cebu was grateful for the honesty of the taxi driver who received P8,000 as reward. He used it to build a comfort room and treat his family to an outing. DPWH was able to provide 7,900 seedlings of assorted tree species DENR. The coffee, narra, cacao and mango seedlings are stored at Camp Marina in Barangay Capitol Site. This prompted acting Community Environment and Natural Resources Office (Cenro) Chief Raul Pasoc ordered the lifting of the CDO. Even with the lifting of the CDO, Dr. Eddie Llamedo, DENR 7 spokesperson, said that DPWH must still comply with certain conditions, which includes ensuring that 85 percent of the seedlings they planted will survive. They will start planting within 15.8 hectares of forestland in the barangays in Cebu City belonging to the Central Cebu Protected Landscape after the El Niño is over. Cebu Daily News: Settlers ask: Where do we go after Friday deadline?